A new monstrilloid copepod species, Cymbasoma cheni sp. nov., from Meizhou Bay (an embayment in Fujian Province, southeastern China) is described and illustrated. The diagnostic character of the new species is the structure and armature of the fifth leg, which is represented by a single lobe armed with three naked setae subequal in length. The new species closely resembles Cymbasoma bowmani Suárez-Morales and Gasca, 1998 in the structure of the fifth legs, and the body proportions, including total body length, and relative lengths of the cephalothorax and the genital double somite. However, Cymbasoma cheni sp. nov. is distinguished by lack of cuticular ornamentation on the cephalothorax, the position of the oral papilla, and the structure of the fifth leg with three naked setae. Although the structure of the fifth legs is similar in Cymbasoma cheni sp. nov. and Cymbasoma quintanarooense (Suárez-Morales, 1994), the new species can be easily distinguished from Cymbasoma quintanarooense by the relative length of the antennule, differences in the genital double-somite and the ovigerous spines, and the shape of ocelli. This is the sixth record of this genus from China seas. 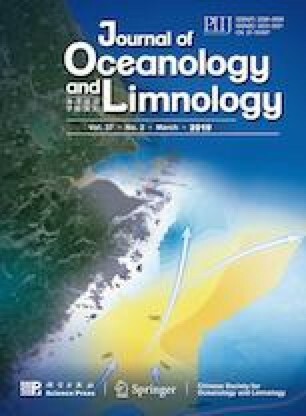 We would like to thank Dr. CHEN Zhiyun (The South China Sea Institute of Oceanology, Chinese Academy of Sciences), Dr. ZHANG Wuchang and Dr. MA Lin (Institute of Oceanology, Chinese Academy of Sciences) for providing helpful comments on the manuscript. We are also grateful to the anonymous reviewers for valuable comments.